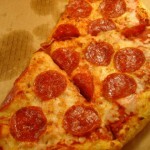 Like it or hate it, the Little Caesars $5 Hot-N-Ready pizza has controlled the cheap pizza market for years. 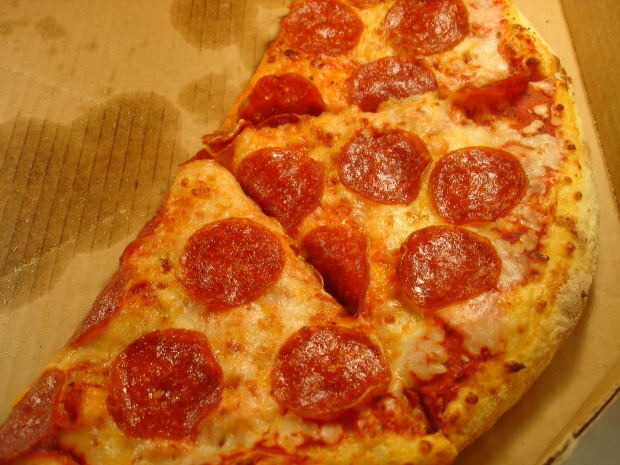 Even if you don’t like the taste, the fact is that because there’s a pizza for $5 available, it’s likely kept the cost down across the board, meaning virtually all pizza has been made cheaper because of the low price of the Hot-N-Ready. Watch movies from the 1980’s and you’ll see that paying $15 per pizza was pretty common. Even premium pizza, after over 20 years, likely tops out or comes in below that price these days, and you have to figure this comes back in many ways to the introduction of the Hot-N-Ready $5 pizza. Uh-oh. Since they’ve been offering this pizza at the low price for well over ten years, I think,, this seemed a little ominous. Last night, we had some errands to run, so we decided to stop and grab one for dinner. Their menu board had a big graphic with the $5 price, but also had the same ‘limited time only’ notation underneath. So, I asked the cashier if the price was going up. I think she wanted to dodge the question, but she finally answered that, yes, the price will be increasing soon. She said that it will likely be going to $5.55 per pizza. This is a price I’ve seen at many locations outside of the Metro Detroit area, where I’m assuming delivery charges and such are higher. My totally wild guess is that those locations will move to a $5.99 price, so that all stores still stay in the $5-something range. So, the proposed standard $5.55 price represents an 11% increase. You’ve seen me complain many times about price increases on this blog, so you probably think this one bother me. But, the truth is that it really doesn’t. Little Caesars has kept the $5 price for much longer than I ever thought possible when I first heard about it. I often thought that, while the $5 price was a brilliant marketing move, it kept them backed into a wall because customers came to expect it. Truth be told, they probably would have liked to have raised the price much sooner, but wanted to let go of the $5 pizza that they were associated with for as long as possible. Could that time be at hand soon? But, that’s not all. I noticed that they’ve already raised prices on other items. Specifically their ‘Crazy Bread’. Every once in a while we would add an order of crazy bread to our pizza order. At $1.99 along with a $5 pizza, it still totaled up to $7.41 (including 6% sales tax), which wasn’t a bad price for a meal for all of us (plus a leftover lunch to take to work for me). The price yesterday on the Crazy Bread: $2.98. That’s a 50% price increase! On bread, butter, and cheese. The 11% increase on pizza is no bother to me, but the 50% increase on crazy bread is crazy. I thought $2.29 – $2.49 would have been more reasonable. I know I’m quibbling over a buck, but it’s more the percentage increase that I can’t get past (and, no, we didn’t get the Crazy Bread yesterday). So, if this information was correct, it looks like the price of pizza (and sides) will be nudging up this year (I would guess that other pizza places will follow suit). Enjoy the $5 pizza while it lasts. It’s been a great run! 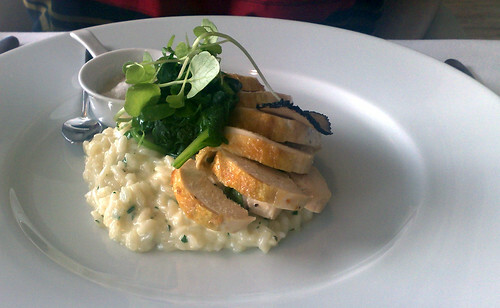 One of the worst kept secrets in the ‘get a great deal’ on dining out has been Restaurant.com. This site has been one of my favorites for years. With the site, you can buy a coupon that gives you a dollar amount off participating restaurants. Typically, you can get a $10 coupon for $3 or a $25 for $10, with each restaurant choosing the terms by which you can use the coupons (some won’t allow you to use them on weekend nights or on holidays or unless your party consists of a certain number of people). The great part about it is that you can typically find a coupon code for 80%, and sometimes even 90%, off the regular price of a certificate. This means that you could get a $10 coupon for $0.60 or a $25 coupon for $2 with the most commonly found 80% off coupon. Sure enough, if you add that coupon to your shopping cart and enter a promo code, you don’t get anything off. I wasn’t able to find much information about why some restaurants are excluded. I’m not sure if the restaurants get a better rate for not participating or how the participation structure breaks down. At first glance, it’s easy to say “Well, I’m not paying five times more for a certificate” and move on. And, that’s certainly a valid option. If you’re browsing Restaurant.com and you’re wavering between two restaurants, one that you can use a promo code and one that you can’t, my guess is the one that allows you to use to code will win 99% of the time. So, why would you buy a coupon at a restaurant that doesn’t allow you to use codes. Here’s a few reasons I can think of. It’s still a better percentage off (60 or 70%) than most Groupon or Living Social deals, which from what I’ve been able to see, give you 50-55% off in most cases. Would the cutbacks on promo code availability cause you to stop using Restaurant.com or would you narrow down your list of potential restaurants to those which are not on the ‘restricted’ list? I’m sure I wasn’t the only one that purchased the Groupon deal for a sub-chain-to-remain nameless that came out over the summer. For the deal, you got two regular subs (up to a $12.98 value) for $6. We waited until a few days before the promotion ended, having sort of forgotten about the coupon. Still, we planned our dinner around getting two subs. We weren’t entirely sure of which subs qualified and which didn’t, since the wording on the Groupon didn’t quite match up with the sub selection that we went through online. 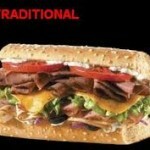 As such, my wife and I had a couple of different options of subs we were interested in depending on what qualified. I stayed at home with the kids while my wife went to get the subs. When my wife went in, she told them that she had the Groupon and asked which subs qualified. She was given an extremely short, somewhat rude answer of “The ones on this section.” With that information, she placed our order. A red flag was raised when the young lady preparing the subs kept asking the manager how much meat went on the subs. 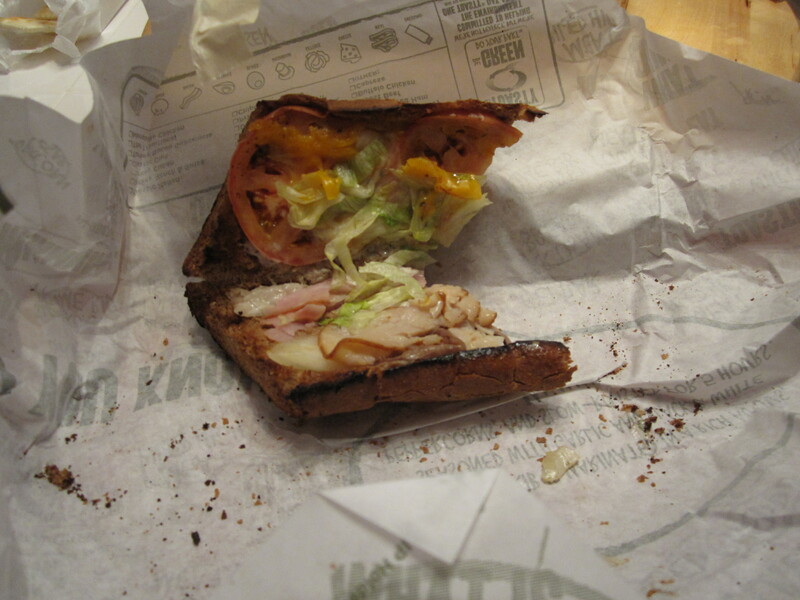 Hmmm…either this person was brand new or were they perhaps putting less meat on the Groupon purchased subs? I’m usually willing to give the benefit of the doubt, but when I saw the subs that we got, I pretty much decided that they screwed us because we had a Groupon. 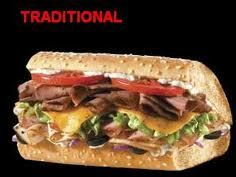 See, I ended up getting the traditional sub. This is how the chain shows the sub on their website and advertising versus what we got. I’m sure you can tell which is which! Quite a bit different, huh? They seem to have a lot of meat and a ton of vegetables. We got two slices of meat, and barely enough vegetables to make it worth mentioning. In their picture, the sub barely closed. In mine, when the sub was closed you could barely tell that anything was inside! I know that most commercials, print, or web advertising is always going to make the product look better than what you get. There’s always going to be a difference. I get that and I give plenty of latitude and temper my expectations accordingly. 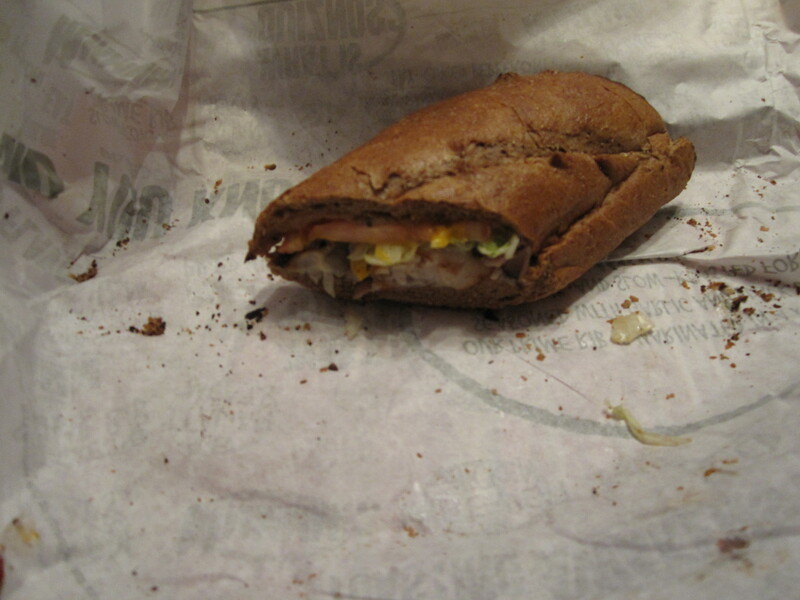 This might have been the worst looking sub I’ve ever seen, except maybe for the one that my wife had that looked equally lacking. Honestly, there was nothing about that sub that was worth the $3 that it worked out to from the Groupon. It was awful, and my wife’s was no better. Now, it just so happened that we had purchased a lot of subs last month. My wife loves Jimmy John’s, and we got that for ourselves once. It was great! 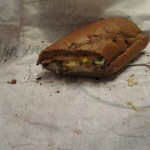 Subway had their $5 for any footlong promotion running, so we took advantage of that deal. Even at a lower price, we got lots of vegetables, a good amount of meat, and felt full afterward. They gave us the same sub even though we were paying less. Our chain apparently missed that memo. It could be that maybe it was just our location. It could be that they had been redeeming these Groupons for a ton of people. It could be that they were a franchised location that was forced to participate. Fine, maybe one or all of those things are the case. But you know what? None of those things are my problem. If those things are indeed problems, they should never be my problem. I was the customer. If they were sick of the Groupon customers or were taking a loss, there are ways that they can handle that. Never, ever should one of those ways involve giving the customer a mediocre product. But, that’s exactly what we felt happened. Before the Groupon, we didn’t go to this chain very often, but they had a chance to make us a more regular customer. If we had received great subs with the Groupon deal, we certainly would have considered them each and every time that we felt like getting subs. 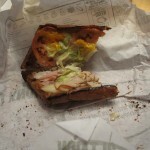 Now, I can assuredly say that I will never choose to eat at this sub place ever again. We went on vacation a couple of weeks back. We went to what had previously been a favorite destination of my wife and in-laws. However, some of the things that happen were so astounding that I think they may have dropped that title. I know that ‘The Village Cafe & Pub’ in Pentwater, MI will not be on my favorites list any time soon. [At the recommendation of my in-laws, we all dined at your restaurant], a place that had been very accommodating to them in the past and had provided many good times. I can only trust my in-laws that their experiences had been great in the past, but being my first time, I was not impressed in the least. I have dined at many restaurants in my lifetime, and have never, ever heard anything like this before. I understand that you may have staffed lightly expecting fewer diners, but to be greeted with that is completely mind-boggling. I know that this isn’t an isolated experience, as my sister-in-law had gone there the night before (with her boyfriend), and she had been told the same thing! If you are getting more customers than you anticipate, you can word this politely to the customers (e.g. ‘We will be happy to seat you, but just so you know, our servers have more tables than usual, so we apololgize in advance if there are any delays, but hopefully you can enjoy the great view!’) or perhaps re-work the numbers on the number of customers you expect when determining how much help to have working. [Later that week, on Friday], my wife, mother-in-law, and sister-in-law were in Pentwater and noticed that each of the outside tables had a rose or some sort of flower on it, where our table had nothing of the sort. All told, it appeared to us that since we were customers on a less busy night, we were not treated as well as customers that dine on your busier weekend times. I understand that the weekday customers might not be the moneymakers that keep you in business, but we are still customers that pay the same prices for the same menu items, and it is not unreasonable to expect the same service and positive dining experience as anybody else. I worked in retail for a number of years, in an area where 95% of the years profits were made between Thanksgiving and Christmas. Even so, all of the customers that came through the doors for the rest of the year were entitled to and treated with the same level of respect and appreciation. Based on what I saw last week, I think you might need to re-think your approach in making sure that *all* customers are given the full experience that you have to offer, regardless of what day or what time they come through the door. So, dear readers, have you ever walked into a practically empty restaurant to be told that you might not be able to be served? This story is so awful it is funny, so I had to share it. What are some of your favorite restaurant ‘horror’ stories?